I love to read. I would be completely happy in life if I could sit on the couch and read a book all day. My favorite types of books are fiction, specifically mystery and thrillers. Some of my favorite authors include John Sandford, Lee Childs, and James Patterson. A few weeks ago, I picked up a book that is completely different from most of the books that I read. It took me a week or so to really start reading and getting into the book, but once I did, I couldn't put it down. 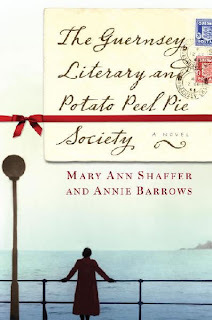 The book is the Guernsey Literary and Potato Peel Pie Society by Mary Ann Shaffer and Annie Barrow. Without getting into details or writing a book report, let me just say I loved this book. I picked up on a recommendation from a friend and wasn't really sure I would enjoy it. After the first few pages, I was hooked. The entire book is written as letters between the characters. As the characters in the book get to know each other and become part of each others lives through the letters, it struck me how this mirrors life today. The characters in the book used letters the same way social media impacts our lives today. Even though they had never met, the characters formed a bond of friendship through their letters, much as we do through Facebook and Twitter. For some reason, that really struck a chord with me. If you are looking for a good book to read, I highly recommend this book. It doesn't take a long time to read and is very enjoyable. I hope you check it out and enjoy it as much as I did. I don't mean the rides or anything like that. I have visited Disneyland a few times in the past, and as recently as 2007. I am familiar with the basic layout and rides. It's the dining situation that intimidates me to the point of inaction. For my family, part of a Disney trip is experiencing the different restaurants and counter-service options available. I know NONE of this for Disneyland. The only thing I do know is that Matthew wants to eat at the Blue Bayou- the restaurant inside Pirates of the Caribbean. Other than that, I have no idea what to do... I have to Unofficial Guide to Disneyland and have read it, but it isn't sinking in! It's like it just goes in one ear and out the other! Should we do a character meal; do I really need ADRs; are there restaurants to avoid; any places we really SHOULD eat??? I just don't know!!! Luckily, the window for making ADRs at Disneyland is 60 days. That means I have about another month to panic and avoid the situation! I know I will get it all pulled together and planned out, but it just feels so weird NOT having it planned out months before I have to! Now, this was not the first Bon Jovi concert we have been to. We saw them in Nov. 2007 in New Jersey. What I remember about that crowd was the "Jersey hair" and that we saw many moms and daughters together. This was a slightly different crowd. The first thing I noticed when we got to the venue was there were a lot of middle-age couples (and by that I mean in their 40's and 50's!). Bon Jovi has obviously kept many of their fans throughout the years. The second I thing I notice is- DANG- there are a lot of 30- and 40- something women who are looking for someone to go home with! I mean, there is a heavy display of tight jeans, high heels, and surgically enhanced body parts (specifically UPPER body parts). These ladies are definitely looking to not go home alone. Now, I gotta be honest- unless they were all hoping to go home with the various members of the band- I don't know who they were hoping to go home with. A Bon Jovi concert isn't exactly the place to find lots of young (20ish) guys. Actually, there really weren't ANY single guys of any age that I recall seeing. The opening band was Dashboard Confessional. The only song they sang that I recognized was Summer of '69 which isn't even one of their songs- it's an old Bryan Adams song. Luckily, they only played for about 30 minutes. After a short break, Bon Jovi came out for their set. The energy and enthusiasm of the show made the time fly by. They performed many old favorites (It's My Life, Shot Through the Heart) as well as several songs off their new CD (Superman Tonight, Love is All you Need). We also got to hear Richie Sambora (who plays a MEAN guitar) sing Lay Your Hands on Me. They played for well over 2 hours. The last song they did performed was Livin' on a Prayer. The audience singing in the arena was so loud that you couldn't even hear the band. I can hardly wait for the next time Bon Jovi goes on tour. You can bet that we will be at that concert- and we will be taking Matthew with us! I have struggled mightily during my last two runs. My legs are tired, sore, and don't want to go. I've discovered why- I'm running way too fast! My run on Friday was just over 5 miles, and my run today was my typical 3.4 miles. They aren't new routes- they are the same routes I frequently run. So why I am going so fast? My natural pace is right about a 10 minute mile. My pace for my 5 mile run on Friday was 9:30/mile and today it was 9:23/mile. What the heck? Where did this speed (for me) come from? I don't feel like I am going any faster- in fact, I've tried not to go fast and just have a nice leisurely run. I don't look at my watch (or iPod) while I run, so I don't monitor my pace as I go. I just go. 1. I love, love, love this weather we are having right now. It is perfect spring weather, and after the winter we had here in PA, we've earned it. It's perfect weather for a morning run and then playing outside until dark. If it stayed like this all year long, I would be happy. 2. I have the most wonderful son in the world! We spent several hours in the Emergency Room with him yesterday (smashed fingers in the car door while rollerblading) and he was sooo good. Actually, he was good through the whole ordeal. I am so proud of him. 3. This wonderful weather makes me wish I was at Disney World. I have never been this time of year, but this just seems like perfect Disney weather. 4. I am glad there is NASCAR racing again this weekend. I missed racing last weekend. Just a warning- this Wordless Wednesday post probably isn't what you were expecting. It's a picture of pasta, for crying out loud. 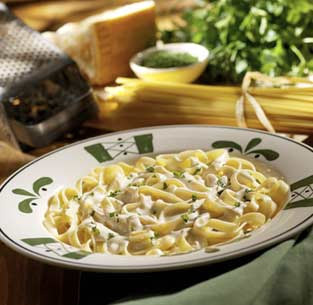 But let me explain- I have been so hungry for Fettuccine Alfredo lately. I even made a lighter version at home the other week, but it just didn't taste the same. I want the kind made with heavy cream, butter, and lots and lots of cheese. The kind that's dripping in sauce. The kind that's a clogged artery waiting to happen. At this point, I'm just settling for staring (and drooling at the picture). But, I think a trip to an Italian restaurant may be in my future soon. I am one of those eternally obnoxious people who can wake up at 5:30 am without an alarm and be happy, awake, and cheerful. I always have been a morning person, and I probably always will be. (Note: my son is just like me, while my poor husband would be happy if the day started at noon.) Now- I will admit that one of the first things I do is have a cup (or two) of coffee in the morning, but that's more because I like it, not to wake me up. I like getting up early and having some time to myself before everyone else is up. I want my hour back. I don't like Daylight Savings Time. I know, it's supposed to save energy and everything good like that. But if I have to use my lights in the morning because it's dark (instead of at night when it's light) how is that saving anything? And really, at the beginning of March, it's too cold to send my son outside to play after dinner when it is light. So that hour in the evening is kinda wasted. There's one other personal reason I want my hour back. My parents live in Arizona. Arizona is one of the few states (along with Hawaii and Indiana) that doesn't follow Daylight Savings. So, my parents have gone from being 2 hours behind us in time, to being 3 hours behind. For some reason, that extra hour makes them feel much farther away. I don't like it. Silly, yes, but true. So all that being said, can I please have my hour back- now, not in November? Ok, thanks! As I've started to pay more attention to the world of blogging, I've noticed that there are certain things that some people post on certain days- such as Wordless Wednesday, Thankful Thursday, etc. Being the kind of person I am, I decided to do my own- Say-it-all Saturday... So here goes. 1. Well, I did it. I signed up for a half-marathon. I have been debating whether or not I wanted to attempt this for a couple of months now. I am doing the Broad Street Run in May, and that's 10 miles- I figured, what's another 3 miles??? So, I am officially registered for the ING Rock-and-Roll Half Marathon in Philly in September. It seems like a good idea right now- we'll see if I'm singing the same tune in September! When I heard this, my first thought was WOO HOO!!! We currently have a 3 day trip scheduled to Disneyland this summer, and two separate 6 day trips to Disney World this year. So, I did a little looking into this passport. Disney- you screwed this one up! The cost for this Premium Passport is $700 per person. Adult AND child. There is NO discount for kids. I've priced this out and it is still cheaper to buy separate tickets for everything than to buy the Premium Passport. I'm curious to know how Disney can up with this pricing, because it seems to me that they really missed the mark on this one. 3. I look out my window and I don't see any snow piles. After more than a month of having piles of snow still over 3 ft high, this is a reason to celebrate! Although we may still have some cooler temperatures that come along, I think we have turned to corner into spring! 4. Thanks to everyone who told me about Site Meter for tracking visits to my blog! I was able to figure it out and install it! Ok- that's about all the unrelated thoughts I have for this morning. Off to make pancakes for breakfast! Well, fast forward about 6 weeks later, and while I am by no means a social media queen, I have a much better understanding and respect for it. It has changed my life in ways that I would have never thought. One of the first things is that I started, and have stuck with, this blog. It gives me a place to put my thoughts down in writing. And even more surprising- there are some people who read it! (And note to blogger- I would like it if I could track my page views...). It's really kinda fun- at least it is once I have decided on what my next post is going to be. I use social media to help me with my blog by following other blogs and absorbing the good from them. I have met people who have amazing Disney websites that I love (like http://www.disneyeveryday.com/). I look at how they network and use social media and I learn from them. I also learn things about Disney from people who are in the know (such as #wdwmoms). Social media has also brought in contact with people in other countries who share some of my same passions. For example, I regularly correspond with a friend on Twitter who is an up-and-coming NASCAR reporter- in the Phillipines! One thing that both of these people do, that I am trying to watch and learn, is effectively network using Twitter and Facebook. They develop contacts and put their name out there using social media. It's all really very cool. One thing about social media that surprises me is how it is really starting to invade our society. On Twitter, you have many big, popular NASCAR drivers (@kylebusch, @dennyhamlin, @mw55) who will hold Q&A sessions with their fans. This brings the fans closer to the sport, and increases exposure. There are many large companies- such as Harrah's, Kellogg, and HP- who are hiring corporate social media directors. They are learning that social media is here to stay and they want to know how to use it. Before I went to the Disney Social Media Moms conference, I had a little (emphasis on little) idea of what social media was and how it worked. Now, I have more of an idea of how to effectively use social media- not that I have it all down yet, or that I am doing it... But, I think it's safe to say I have a little more of a clue than I did when I started this journey! I hope this picture bring as many smiles and happy memories as it does me! While I was out for my run this morning, I was trying to think of what my next blog post would be. (Now, this was kind of difficult because my legs were DEAD and I really just wanted stop and walk...) I really like the idea that several of my fellow bloggers have done recently (shout out to Rora and Kristin), which is post a list of questions and answer them. But, I didn't want to seem like too much of a copy-cat. So, I thought a little but more about what I could say about me and decided to expand on two of my favorite things. Now- the first two of those probably make sense to most people. They seem to go together fairly well. It's the last two that tend to make people do a bit of a double take. Throw Disney in the mix, and things still make sense to most people. After all, Disney is very family friendly, "The Happiest Place on Earth", etc. People look at me and thing- OK, I can see that she loves Disney. She certainly goes there enough... I can talk Disney with anybody and I will. I've had conversations with strangers about where to stay and where to eat. The last one, NASCAR, tends to throw people for a loop. I have watched NASCAR for about 10 years now. And I love it. I like the personalities, the drivers (most of them), and I like the fans. I love to talk about NASCAR. The only problem is, it seems there are a lot less people willing to talk NASCAR than Disney. Since the start of this NASCAR season, I have heard several times from my friends "I can't believe you like NASCAR" or similar statements. This doesn't bother me, I just say "Yep" and go on. Now, Disney and NASCAR may seem to be completely different interests that really don't mesh. This may be true, but yet they do have a few things in common. They both have fans that are very vocal. The online Disney and online NASCAR communities are both full of people who are very knowledgeable and eager to share their knowledge with you. You can strike up a 30 minute conversation with any Disney fan by simply asking "What's your favorite ride." Ask a NASCAR fan "Who's your favorite driver" (or this week- "What do you think about Carl?") and the conversation flows. So- now you know a little more about me. And hopefully all my Disney friends on Twitter will be a little more understanding when all the #NASCAR tweet fly, and all my NASCAR friends will understand why I have all the #Disney tweets. And for those you that like both (SISTER! )- enjoy all the tweets!!! I know, I know. I haven't posted much this week. But I have a really good reason for it. There's this bright yellow thing in the sky- and it's making the temperature get above freezing, and all the white stuff on the ground is going away. I sit down at my kitchen table to write something, I look out the window- and then... I just keep staring. I feel more than a little like Dug from the movie UP. Whatever he may be doing, he sees something move and "Squirrel", he's distracted. I look out and see the sun, and just start thinking and daydreaming about spring, warm weather, and well, just seeing grass again. So- pardon me while I'm a distraced. I'm sure that we haven't seen our last cold spell, and when it comes, you'll find me back at my computer. But for now-- "SUN!" For this wordless Wednesday post, I thought I would let Maya Angelou do the talking. A friend recently sent this to me, and the truth of it struck me. EVERY WOMAN SHOULD KNOW... how to fall in love without losing herself..
Ok- wait a minute. Is it really March 1. What happened to January and February? I mean, I know we had some snow (ok- a lot of snow), and I was kinda busy, but still. How is it March already??? The problem with it being March is that I only have 2 months to get ready to run the Broad Street Run in Philly on May 2. That's a 10 mile race. The longest race I have run up to this point is 5 miles. I have to go DOUBLE that- soon! I know that some people train and know if they can run 8 miles, they can do 10 miles on race day. I can't do that. For me, I have to know that I have done 10 miles before and can make it. Yes, it's a mental thing- but that's how it works for me. So- maybe now that it's March, Mother Nature will get her act together and stop messing with our weather. I run at the Y, but there are only so many times I can go in a circle around the track. I need to get outside and pound the pavement. And apparently, I need to do it soon!! !